The Avenger Boys are a savage and unpredictable duo of Mute (The Man Who Hates Fun) and blind (The Fun Who Hates Man). 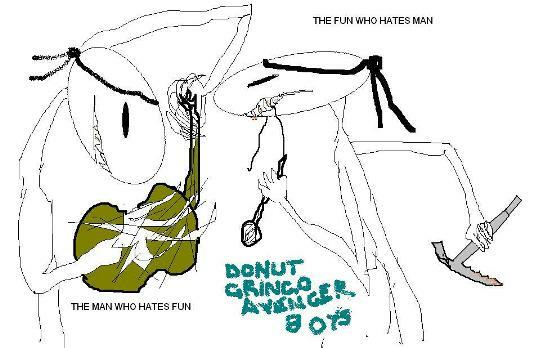 Since forming in Canberra, Australia, from the ashes of 14-piece techno/martial arts combo The Donuts in 1999, the Avenger Boys have been pioneering their unique brand of smash-and-grab loungetronica. With five albums, a 3-record deal with a major record label and a string of tours across Central and Northern Asia, the Boys have returned to their roots and will be rocking out ONLY IN CARPARKS for the foreseeable future. Get more info, read lyrics and download sample tracks from the Avenger Boys’ most recent album Harsh and Synchronised right here! why haven’t the people heard anything new from you recently? what are some of the festivals at which DGAB have recently played? where has your touring schedule taken you in the last several months? KOREA. MEXICO CITY. RUSSIA. MONGOLIA. INDONESIA. CHILE. THE DOMINICAN REPUBLIC. NIGER. MADAGASCAR. IS THAT ENOUGH? DO YOU GRASP THAT WE’VE BEEN BUSY, YOU DUMB BOYGIRL? is is true that DGAB is about to release a cover recording of Angela Chang’s Beijing Top Ten hit ‘Aurora’? IS WHAT TRUE, FUCKER? CAN YOU PHRASE THAT AS A QUESTION? it is true, isn’t it, that DGAB has recorded a cover of the mainstream Chinese pop hit ‘Aurora’ by Taiwanese pop singer and actress Angela Chang, adapted for the Gringo Avenger Boys’ unique Factory-Floor Acro-balance-core style, after DGAB saw Chang’s impressive performance of Zhang Yusheng’s “The Day Without ????? ?” at the Rothernacker Village Festival Singing Contest in Canada in 1998 while The Man Who Hates Fun and The Fun Who Hates Man were negotiating the sale of weapons and communications technology to a terrorist cell working from a Lutheran monastery in the Canadian Rockies? in a respected magazine: covers the downfall of the Donuts and the early period of the Avenger Boys up until the release of their first album, Destination: Brain.